You feel that? Hear it, too? It’s the sweet vibes and wonderful sounds of summertime. The season is hard to ignore; it seems to constantly be beckoning to any and all who will listen to head outdoors and soak up that sun. From the concrete jungle of New York City and green-filled escapes upstate to the lively Las Vegas Strip and beachside Southern California towns, there’s no shortage of summer fun—especially when MedMen is involved. To keep your seasonal escapades going strong, we have compiled a list of the ideal strains to accompany your favorite outdoor summer activities. Summer is the perfect excuse to take any indoor event and push it outdoors. Our favorites? Movies, concerts, live theater, and performances of all kinds. Rooftop Cinema Club and Cinespia offer up a slew of outdoor films all summer long—with lineups that range from classic 80s flicks to current indie films. For those chill movie nights, we suggest King’s Garden’s Banana OG or Blue Cookies from Autumn Brands for some indica-focused fun that will help you sit back, relax, and enjoy any film. Nothing beats a bit of culture and a punch of cannabis whilst basking in summer greatness. For those looking for something a bit more uplifting for those summer concert series, we’ve got two sativa strains to add to the list: Sour Sop from Cali Pack Co and Purple Frost’s Schamell #9. Whether you’re bopping along to some jazz tunes or are dancing the night away for hours on end, a sativa strain is your go-to move. Want even more excitement? Sour Sop from Cali Pack Co and Purple Frost’s Schamell #9 work beyond the concert experience—yes, we’re talking about Las Vegas, where MedMen’s outposts offer up the ideal Las Vegas pot shop experience. Whether you’re dancing the night away or chilling at the pool, those looking for a cannabis dispensary near Las Vegas need to look no further than MedMen. There’s no better feeling than packing up the car and heading to the greatest escape of all: nature. 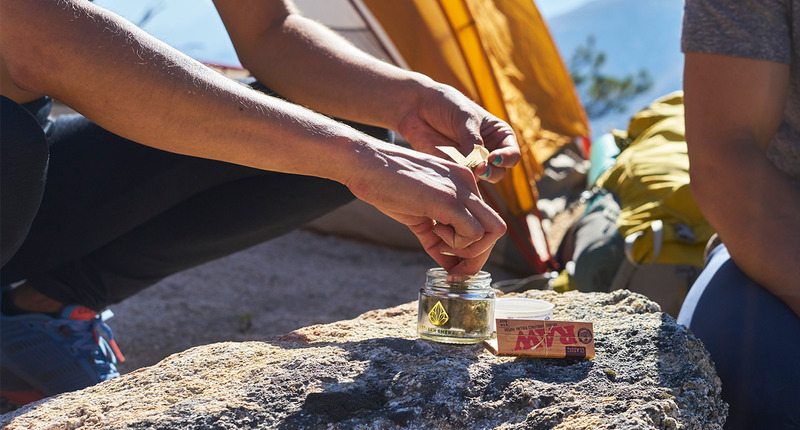 Whether you’re a novice hiker looking to explore or a tried and true camping expert, it’s always an amplified adventure when you bring along some marijuana. Before you hit the trails and venture into the wilderness, we’ve got two suggestions for you: White Fire OG out of Phinest Cannabis and Fade Co’s White Buffalo. Insider tip: set up your tent before you get to smoking. Up and Moving from Therabis incorporates natural hemp oil as well as other beneficial nutrients such as Vitamin C, Chromium, Vitamin E, and green lipped mussel in their core formula to give dogs an extra pep in their step as they age. Whether it is back issues, hip pain, or joint immobility, Up and Moving helps your dog get moving in a way that is natural. After a long day of hiking and enjoying the outdoors, you’ll most likely be tired and ready to chill. While that campfire is going and the stargazing action is in full force, why not ease into relaxation with White Tahoe Cookies by Emerald Family Farms or even whip out a Dosist Sleep pen? Chances are fairly high you’ll get zen with nature with these two strains involved. A bit sore from the day’s activities? Bring out some MedMen Super Glue or even a Vive Lemon/Lime Tab—indica and CBD, respectively, these are great options to get your body back on track and your mind at ease. And of course there would be no summer list without the quintessential water-filled and beachside activities. From boating and surfing to stand up paddle boarding and just straight up beach chilling, FadeCo’s hybrid Gelato Cookies and Purple Frost’s Treasure are winners in our book. There’s nothing better than a nice high while basking in the warm weather and enjoying a nice ocean breeze, and these two strains will truly amplify the thrill of it all. Not a water person? Walking along the boardwalk, enjoying beach games that keep you on the sand, bike riding, and even grilling outdoors are prime options to get the most out of the season. Add in a Dosist Bliss vape pen to push your worries away or Cali Pack Co’s Chocolate Hashberry, a nice indica strain that will make the busy boardwalk feel like a dream. To end this list we have one final reminder: the legality of cannabis puts forth the fact that you can enjoy your goods in your home—not public spaces. Be smart and happy summer!